Living in Paris is wonderful, but it’s not the cheapest place on earth. This came home to me recently when, after having a simple cup of coffee in a café, I got socked with a €6 bill. Almost 7 dollars, for a not-so-big cup of coffee. Argh. Not all of Paris is so exorbitant, of course. Still, as I left the café, I couldn’t help grumbling, half-seriously, that one day I’d move to a more reasonably priced area in France. After all, there are plenty of affordable regions and cities in France to choose from, places where no one would dream of charging you €6 for coffee. The brilliant light of Paris often shadows this exceptional city in the Rhône-Alps region of France, but it’s a mistake to overlook it. 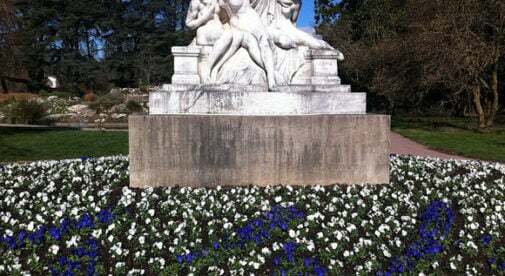 Graced with two curving rivers and sided by two towering hills, central Lyon has natural beauty and sense of openness that is unusual in a major urban city. Add to that diverse and colorful architecture, fascinating artwork and a cheerful vibe, and you’ve got yourself one striking city. Lyon is probably best known in the world as France’s gastronomic capital. And that’s not wrong. You’d have to work hard to find a bad meal here (I never have), especially given that the city offers more than 1,500 restaurants to choose from. And not only is the food of exceptional quality, it’s reasonably priced. I had a three- course meal at one of Lyon’s oldest bouchons (a special local restaurant known for serving up hardy Lyonnaise cuisine), where I had a huge salade Lyonnaise, a small roasted chicken, and chocolate mousse for about €30 ($33). To be honest, I was stuffed after the salad—but I couldn’t bring myself to stop eating. It was that good. But there is so much more to Lyon than food. Moving through the city is like taking a trip through history. From the astonishingly intact Roman ruins on Fourvière hill to the dusky rose-colored medieval buildings in the old town, to the funky glass and steel modern structures on the Presqu’île, nearly every age is represented. Lyon is also filled with fascinating museums and theaters, offers open-air concerts and festivals, and diversions of every kind. Despite offering so much, housing costs in Lyon are a fraction of the price in Paris. Today, you can rent a beautiful two-bedroom apartment with hardwood floors and decorative details in the center of town for less than €1,600 – €1,800 ($1,750 – $1,975) per month. If you’re looking to buy, the average square meter price for an apartment is € 3,328 ($4,278). It might seem pricey, but compare this to Paris, where the average square meter price is €8,252 ($10,698)! If you’re like me and have a weakness for pastoral countryside with brown-and-white cows grazing in verdant meadows… miles of apple orchards bursting with bright red fruit… quiet storybook towns filled with half-timbered houses and shops… stretches of soft golden coastline that offers fresh air and a sense of lightness and freedom, then Normandy may be the place for you. 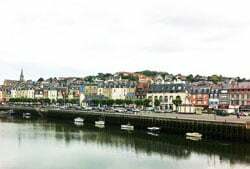 Divided into upper and lower sections, Normandy is often associated with the D-Day beach invasions of World War II, but that’s just a small piece of what this region is about. Although the region dates back to antiquity, Normandy came into its own in the 10th century, when it was established as a duchy and became one of the wealthiest provinces in the kingdom. Normandy offers an abundance of medieval sites to visit, and despite being just two hours away from Paris, it remains affordable. As a result, the entire area is rich with medieval sites and treasures, from the famed 11th-century Bayeux tapestry, to the Place du Vieux-Marché in Rouen where Joan of Arc was burned at the stake, to the Mont St. Michel, a breathtaking medieval monastery set on an island that is approachable on foot for a few hours during low tide. This lovely region offers no end of things to see and do and it’s only two hours away from Paris, yet, it’s quite affordable. In the countryside of lower Normandy, you’ll find properties for amazing value. You can find characteristic half-timbered three-bedroom house with exposed wood beam ceilings and large grassy plots at prices ranging from €87,000 ($95,400) to €150,000 ($165,000), on average. Real estate prices rise in pretty coastal towns such as Honfleur, Trouville, and Cabourg. But the setting is so idyllic and many other costs (such as groceries, dining out and entertainment) are so reasonable, you may find the higher housing prices worth it. I’ve only been to Brittany in poor weather– and if you can love it then, then you know you’ve found a special place. Just west of Normandy, Brittany shares many of the same characteristics: beautiful pastoral settings, small towns full of half-timbered and stone cottages, impressive coastlines. But there’s something dramatic and mystical about Brittany that gives the region an unexpected edginess. Often called the “Land of Legends,” Brittany brims with mythological tales and folklore descending from its Celtic heritage. Brittany is where you’ll find the ancient forest Brocéliande (now called Paimpont), which legend says was once King Arthur’s forest. Merlin is said to have roamed there and unfaithful knights were held captive in the Vale of No Return. While Brocéliande is the most famous, countless other sites in Brittany are associated with stories of fairies, pixies, mermaids, demons, devils and other mythical creatures. Sometimes when you’re walking in the woods or along the Breton coastline, you can feel their presence. Brittany isn’t all set in the past, however. Its cities and towns play host to a variety of music festivals, ranging from contemporary to rock, and its modern art scene is growing. The “people and nature” photography festival in the small town of La Gacilly, where thought-provoking, larger-than-life photos are set all around the town, is on my must-see list. In terms of affordability, Brittany is one of the best value areas of France. Here’s a region where elegant centuries-old stone houses are regularly on offer for less than €100,000 ($110,000). And if you’re looking for a fixer-upper project, you’re especially in luck: old houses with “great bones” and large gardens abound for less than €40,000 ($44,000).